We are very thankful for our loyal Clients! 03/22/2019 In one phone call consultation I got more value thrown at me than I’ve ever gotten before. I strongly urge you to at the very least schedule a phone consultation with Acute. Your website deserves it! 12/04/2018 Derrick and the Acute SEO team are professional, hardworking, and good at what they do! Two days after signing our contract our company (who was not ranking at all on Google) began ranking number 1 in multiple caterogies and locations. Derrick is accessible and spends time to learn your business and answer questions. He is intelligent, honest, and kind. Having talked to multiple SEO companies, Derrick was the most responsive and authentic. 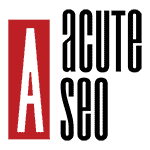 Highly recommend Acute SEO for your SEO and online presence needs. Best digital marketing company around! 08/31/2018 AcuteSEO works hard and thinks outside of the SEO box to generate results that few others can do. In today's world where everyone is throwing money down a hole, AcuteSEO works smarter so your dollars matter. 08/31/2018 Derrick has helped me develop and run my digital marketing so I can connect with today's customer. When I run a new idea by him, he finds a solution. He has gotten me to the top of searches and gotten my phone ringing with new business. 08/30/2018 Acute SEO agency can handle all of your digital marketing needs. They specialize in SEO but are also great at website development, PPC, reputation management and many other important factors for a successful business. They have helped our company rank on the 1st page of google for several locations. They are very consistent and really focus on the customer service aspect of ensuring that their clients needs are met. Highly recommend this company if you are looking for assistance on generating more revenue and taking your company to the next level! 11/07/2017 Great knowable SEO guys. 10/29/2017 Derek is most knowledgeable and professional when it comes to any technical work regarding my webpage. I would definitely reccomend his services! 10/20/2017 They do an outstanding job! 10/10/2017 Working with Acute SEO has been one of the greatest things I have done in my entrepreneurial life! Derrick has helped my so much in my web design, and SEO rankings, I can not wait to start a facebook and instagram campaign in the upcoming months to see what kind of positive result we get in the upcoming year! 10/10 would highly recommend. 09/27/2017 What a great program thank you Derrick for always being there for my business! 09/27/2017 Acute SEO has been a tremendous help in growing my business. Our online presence was next to nothing prior to working with Acute. Now I am happy to say we are getting more calls, more visits to our web page, and more business. 04/05/2017 I didn't know where to start when marketing my business. I spoke to Derrick a few months ago and he helped get my business to the top of the google with a new website. I've had calls everyday and new customers daily with what he did. Best decision I ever made. You get what you pay for. 5/5! 02/13/2017 Thank you Derrick from Acute SEO, without your help and and patience our page would be ranking on Google right now! They are wonderful!